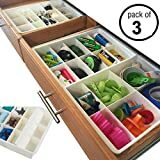 SET OF THREE roomy, sturdy, washable organizers 13.5 x 9.75 x 3.25 – with 6 long and 12 short dividers you can use to make up to 15 cells in each box (for a total of 45 cells). ;Completely Adjustable: Your set comes with 3 organizers with moveable dividers. Move lengthwise and crosswise to make the size of cells that work for you. ;Easy to Clean & Stackable: Put them in a drawer or on a shelf. Completely waterproof and washable. ;Sturdy and Long Lasting: Stiff dividers, sides and bottom keep all your items from being crumpled. ;No Hassle Guarantee: We back our product with a no risk guarantee. If you are unsatisfied in any way, we will gladly refund your money.